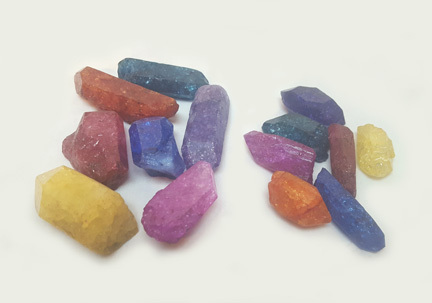 Dyed Quartz Crystal Points come in 50 piece bags at $.35 and $.75 each. Available in assorted colors only. Colors included are red, pink, orange, yellow, green, blue, and purple. $.35 size (DQCR/35): approx 1" - 1.75"
$.75 size (DQCR/75): approx. 2" - 3"